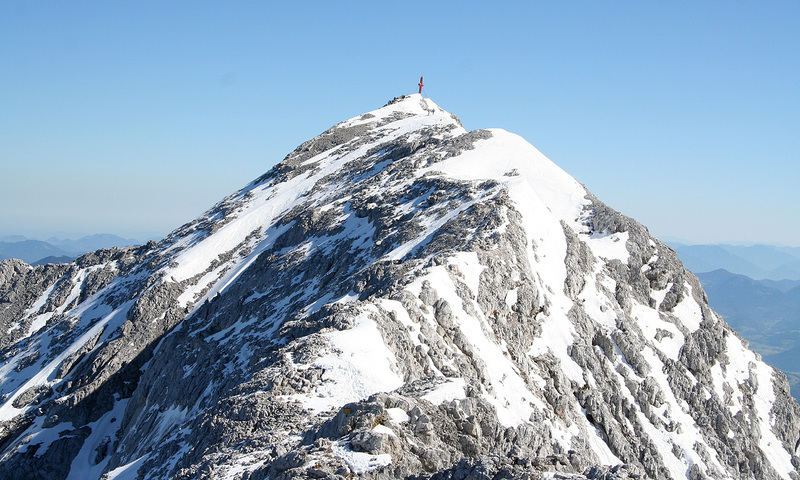 How to get there: Grosser Priel is the ultra prominent mountain that is closest to the city of Linz. From Linz, the drive is about 80 kilometer. First, take autobahn A1 towards Salzburg, then change to A9 going south towards Graz. Exit almost immediately to Voitsdorf and follow signs to Pettenbach. Locate Hwy. 120 in Pettenbach and drive this road in the direction of Gmunden. About 10 kilometer from Pettenbach, turn left into the village of Müldorf. 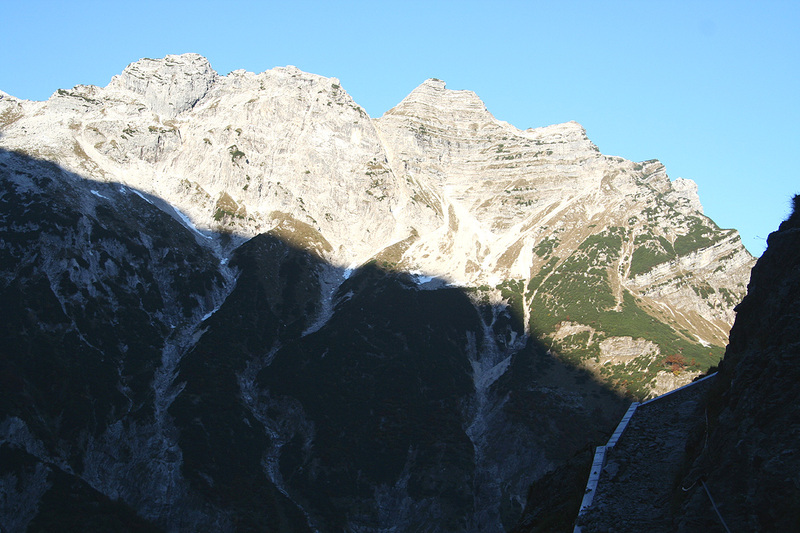 Continue 7 kilometer to Grünau, you are now in the valley of Almtal. Another 9 kilometer gets you to the very small place of Habernau. Habernau has a good "Gästhof called Jagersimmerl. This is highly recommended if you need a place to sleep or a good meal. This location is at N47:46.692, E013:57.691, elevation 575 meter. When I was there, this also (to my surprise!) was the trailhead. The road further along to Almtaler Haus was closed. This was said to be due to the hunting season, however, these hunters (the only intolerant and unfriendly Austrians I have ever met), kept driving their cars in and out, while enforcing a "no bicycle rule" on this paved road. Clearly, what they wanted was to limit peoples access to the mountains, it seems clear that a bicycle would cause less disturbance than a man walking. If this road is open, then one can proceed by car on a very nice, paved road to Almtaler Haus, said to be another 7 kilometer up the valley. 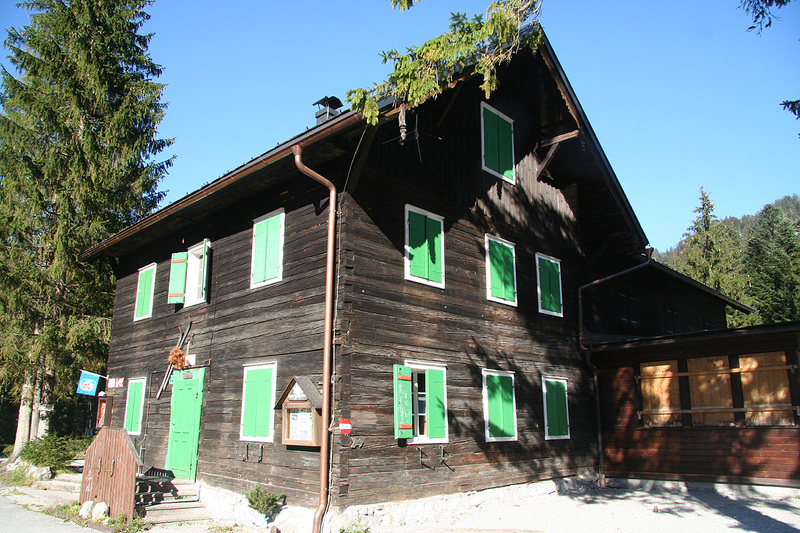 Almtaler Haus is located at N47:45.282, E014:01.065, elevation 720 meter. Route description: First, if the road is closed, one can walk from Habernau to Almtaler Haus in about one hour (fast walk). From Almtaler Haus, the path is marked (route 215) and there are several signs for Welser hut which is the next destination. The route follows a path a short while, then runs along more roads, but not paved any longer. When you reach location N47:43.934, E014:01.804, at roughly 875 meter, the mountains are seemingly going straight up right in front of you. 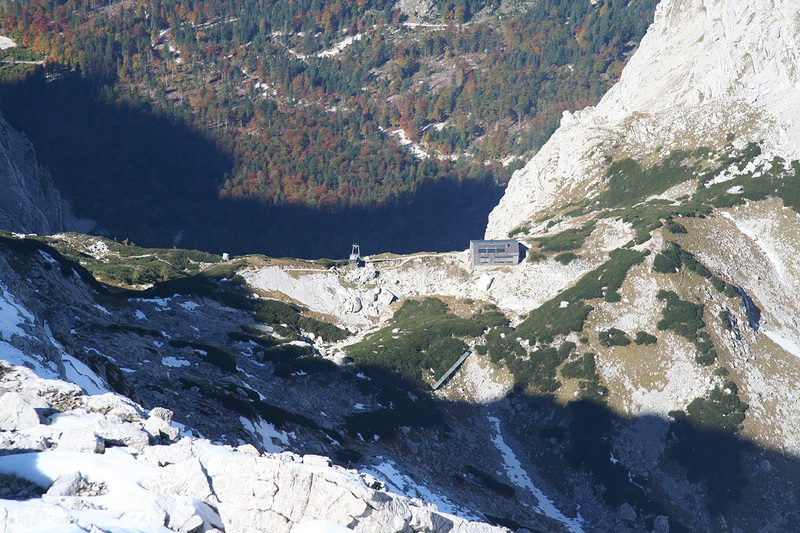 From here, the trail climbs in numerous zig-zag patterns about 850 vertical meter to the Welser hut. 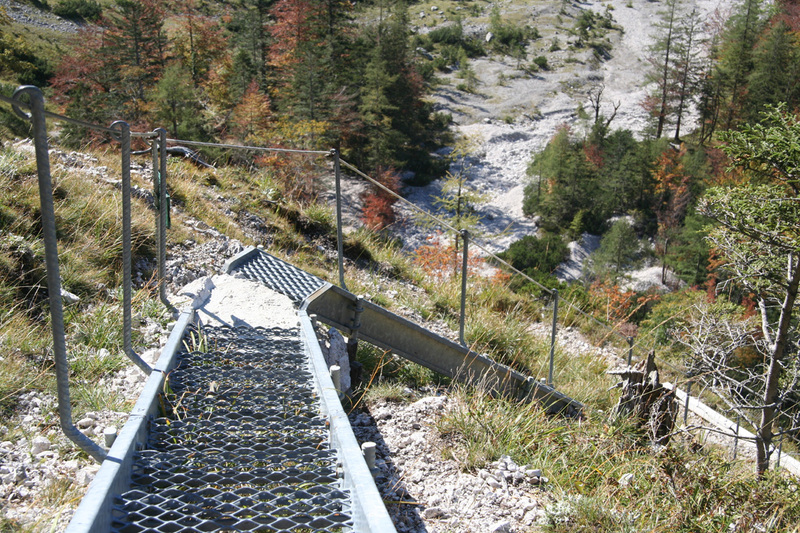 In the very beginning, the trail contours nicely around a cliff and subsequently enters a metal stairway, before continuing in a more traditional way uphill. 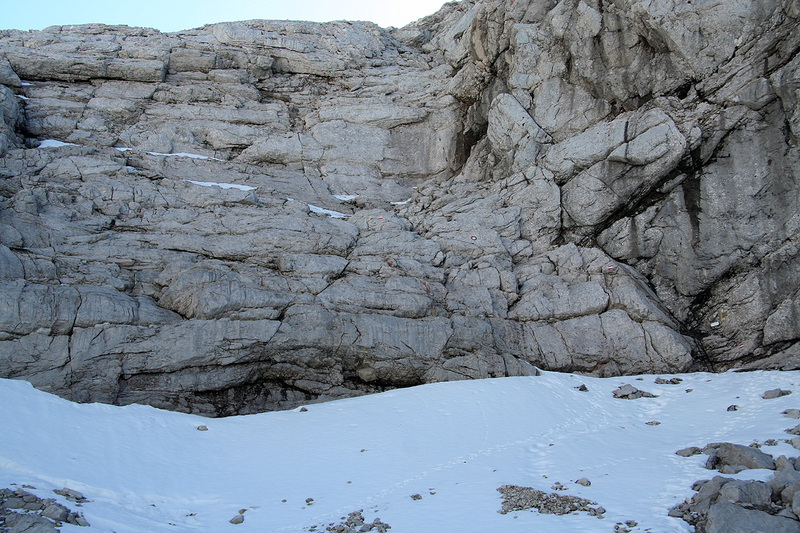 Shortly before the hut, there is another ladder bolted on the rock, however, here one may also easily hike up some (slightly loose) talus on the right side and thus avoid using this ladder. Welser hut is located at N47:43.417, E014:02.949, elevation 1733 meter. Grosser Priel is just above the Welser hut, the access route runs south up an obvious valley to a col named Fleischbanksattel at location N47:42.692, E014:02.740, and elevation 2122 meter. There is one distinct rock-step along this route, but this section is equipped with a couple of short iron ladders as well as a wire cable. 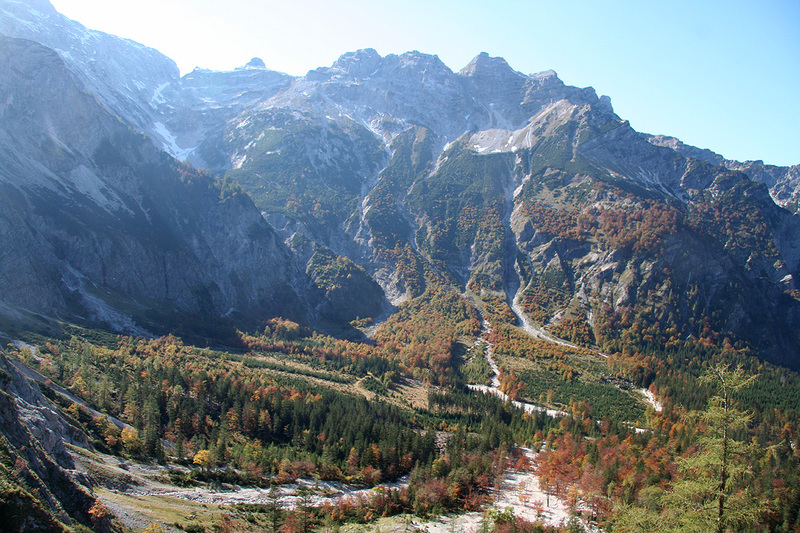 From the Fleischbanksattel, the climb continues left (east) up a very gentle and very broad ridge. This route is marked as route 262 on the map. 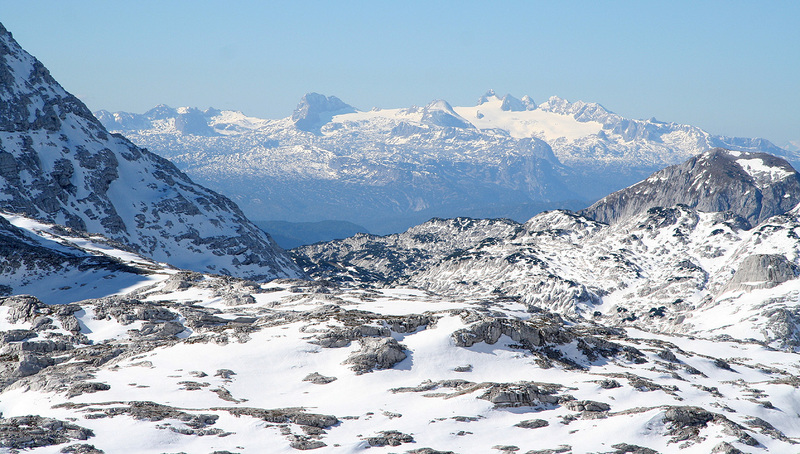 Finally, you emerge on top of this ridge and can see the summit some 500 meter further to the east. 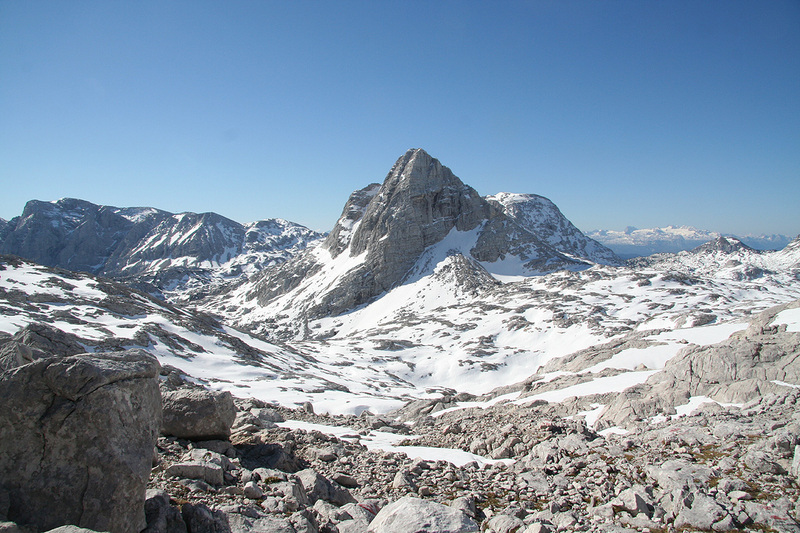 A route serving the mountain from the east side, merges in at this point. This last section, is almost horizontal and runs along a nice ridge with some exposure on your right (south) side, while the left side is less steep near the top. (However, that changes quickly into near vertical further down!) Be aware of possible cornices hiding gaps in the ridge if the ridge is snow covered. The summit has an absolutely enormous cross (that nobody carried!) as well as a summit register. 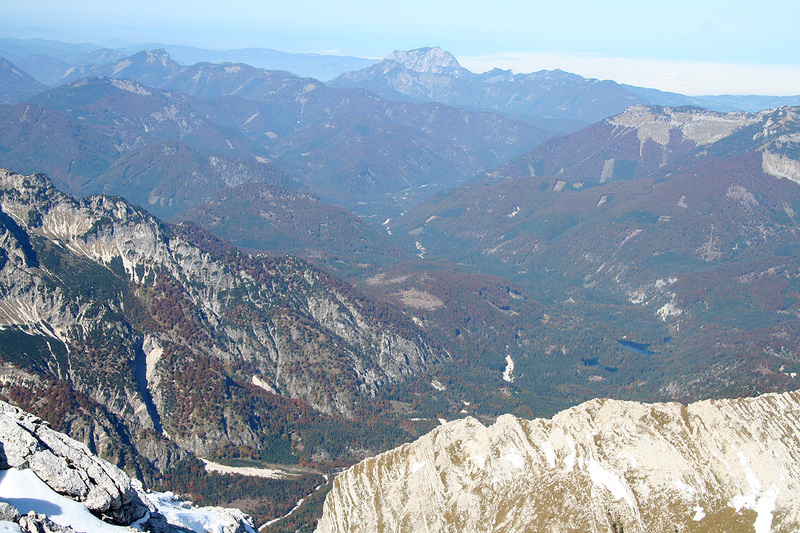 There is also a direct "Via Ferrata" ridge route from the east side that arrives directly to the summit point. Comments: I arrived in Habernau after a nice drive from the base of Reisskofel. Aiming for a nice evening meal around 1900 at the Almtaler Haus, I was somewhat surprised to find the road closed for traffic. The good news was a very nice gasthof, Jagersimmerl, right here in Habernau, the bad news was that a mountain route that was already described as long and heavy, just got 14 additional kilometer added to it. Anyhow, I had an excellent dinner and asked if I could possibly rent a bike for the next day. This way I could bicycle in to Almtaler Haus and roll nicely back out after my climb, quite a good idea. The people at the gasthof were extremely helpful and soon I had secured a bike, even free of charge. They did advice to only bicycle on the paved road, ie. hike the dirt road that still continues several kilometer, appearently these "hunters" do not like bicycles, however, as I observed, they do allow large trucks for hauling timber to operate there. The next morning, I was out by my car already at 0500, in order to organize my equipment. I did notice a black sky with brilliant stars, still pitch dark, a sure sign that fall had arrived. By 0600, I was ready to start out. It was still dark, so I used my Petzl headlamp. Unfortunately (yes this was really bad luck! ), I met a car with hunters after only a few hundred meter. Totally unfriendly, they pointed out that the road was closed to traffic and that this also applied to bikes. I had to turn back and park my bike, then set out on foot at 0615. At least, it is good that one can walk, in the USA, this had likely been a "no trespassing" zone. I walked rather fast and made Almtaler Haus in roughly one hour. By 0800, I had arrived at the bottom of the steep climb going up to Welser Hütte. The morning sun was hitting the peaks around me, very high up, and my target was the very highest one. The ascent went quite well and sooner than expected, I could see the hut. Quite a bit remained, but by 0930, I arrived there. Surprisingly, I met a single hiker there, but he came from the north-east side and walked off-trail. I took about a 30 minute rest before setting out around 1000. At 1050, I was already at the main col and still felt pretty good. 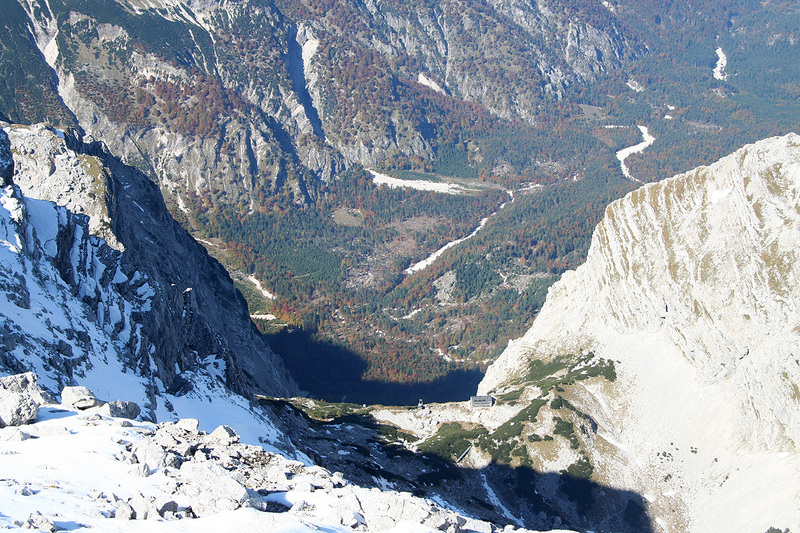 Only 400 more vertical meter, nice weather and a very interesting landscape, what more can one ask? However, this slope soon had an effect and my body started sending an unmistakeable message: "I am tired, need water, need energy, need rest, etc." Hmmm, my rate of ascent certainly got slower and morale was a bit low. An extra rest was called for, I checked my GPS and read 2359 meter, about 150 more vertical meter. 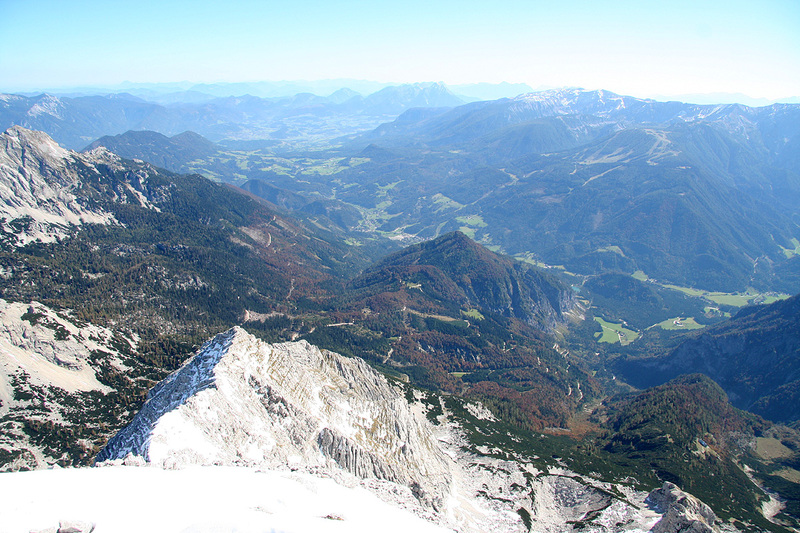 The view was nice, the Dachstein (that I climbed last summer) immediately caught my attention. This all changed when I suddenly reached the crest and could see the summit cross at the end of a rather nice and interesting ridge. Thus, I arrived at the Grosser Priel summit shortly before 1200, that is about 5:45 including the rather long rest at the Welser hut. A few other hikers arrived about the same time. 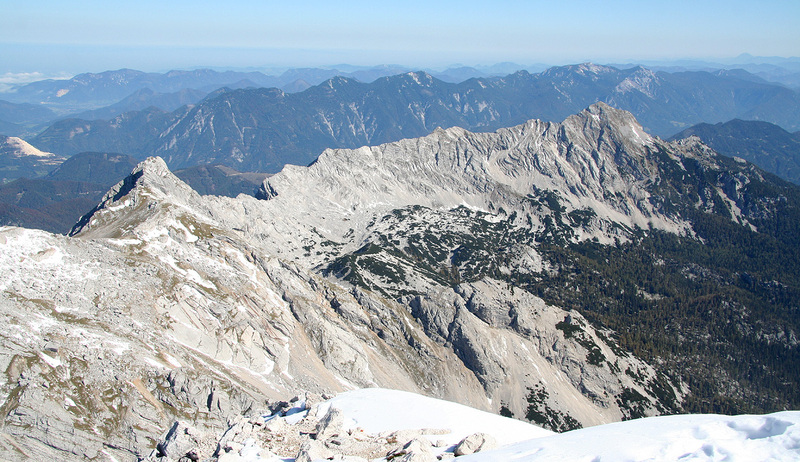 A single woman came up the Via Ferrata route, while a man and a couple of ladies arrived, also from the east side, but via the same summit ridge as I traversed. The peaks that had towered above me at the base, now all were indeed lower. The intersting peak that rise on the other side of the Welser hut is much lower. 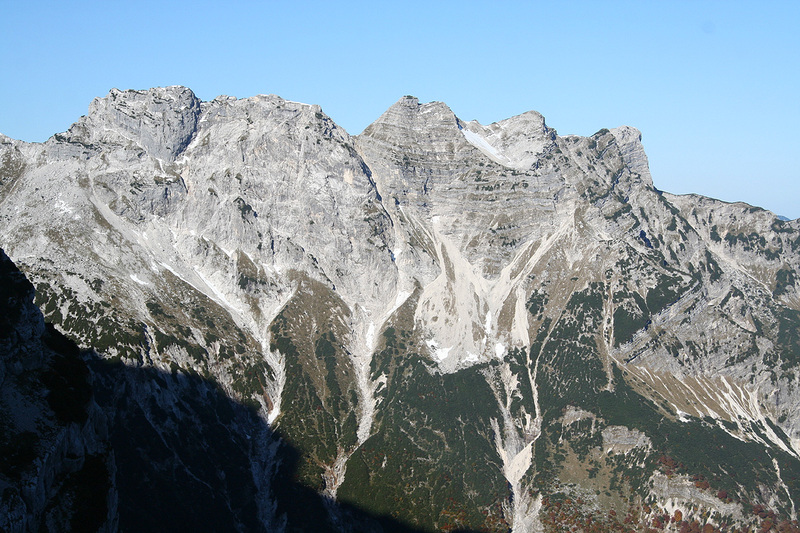 The entire Almtal, including the extra 7 kilometer extended nicely to the north. On the east side, the view is very different, the valley looks more populated. I carried a single slice of bread (saved from a rather minimal breakfast) and it seemed reasonable to eat it here. Nice views, photos and rest. The way back home was long, and at 1230 I started going down. It is interesting to look down from the ridge and straight onto the roof of the Welser hut. 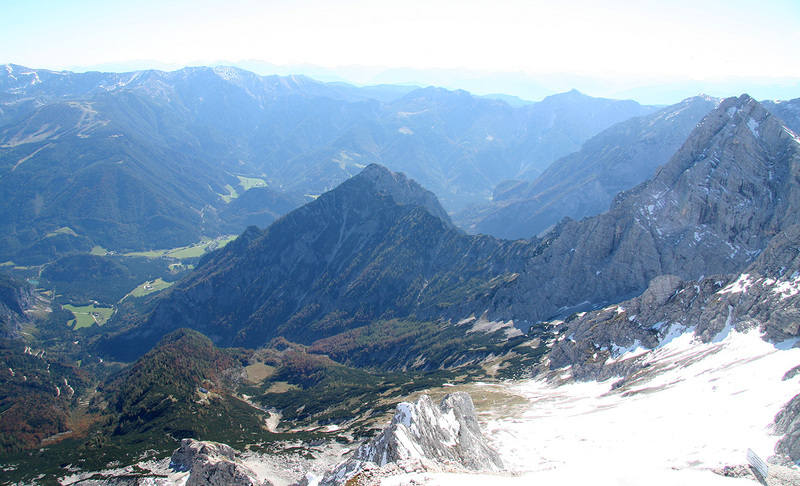 Similarly, one looks just beyond the hut and directly down to the valley floor. I was back at the Welser hut at 1400, took a 10 minute rest and refilled my water bottle (the hut was closed, but a hose filled water into an open tank). Carefully descending the steep trail, while enjoying the great view. 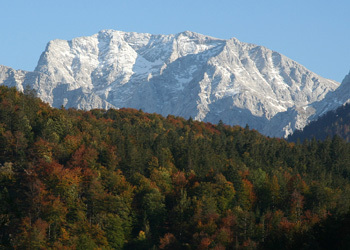 The mountains across and the very nice fall colors from trees and vegetation below me. I made it back to Almtaler Haus by 1550 and decided to take a longer break that included changing to dry socks before the last 7 kilometer of road walking. Leaving at 1615, I was back at the Jagersimmerl gasthof by 1715, a total trip time of 11 hours. I decided that another good meal was called for. Ordered "Ein Grosser Bier" and the best meal of the menu. The kitchen did not disappoint me and I was quite happy by the time I started my drive back to Linz. I was happy about the fact that this drive was only a bit more than one hour, a three day weekend that will be long remembered for excellent weather and three very different, but all very fine mountains. 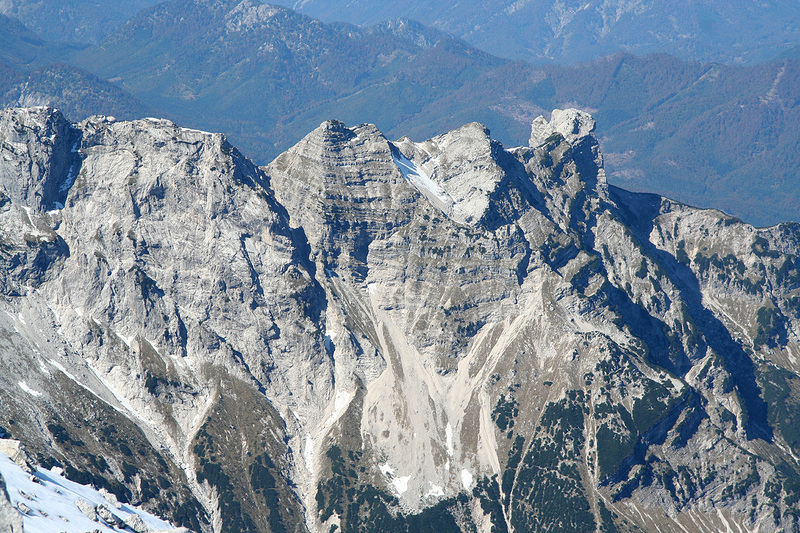 Grosser Priel, as seen from the valley while hiking out. 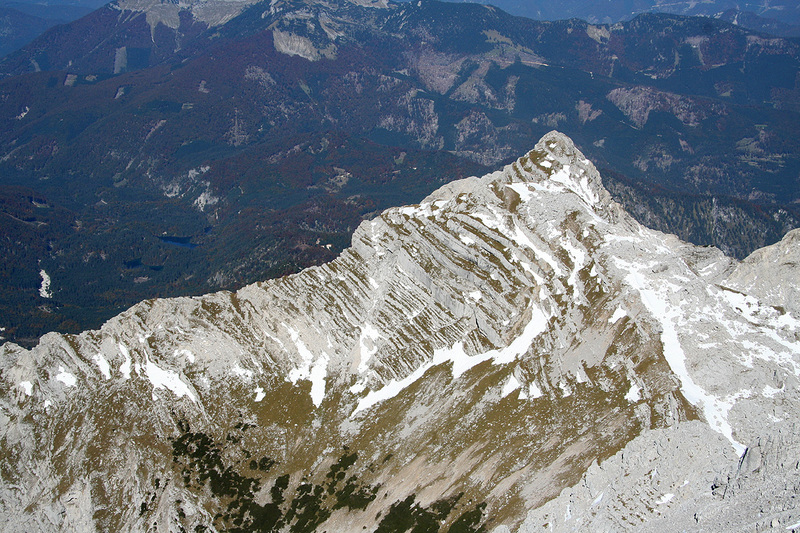 A sharp ridge, as seen from the summit.